← How to convert TIF to PDF? 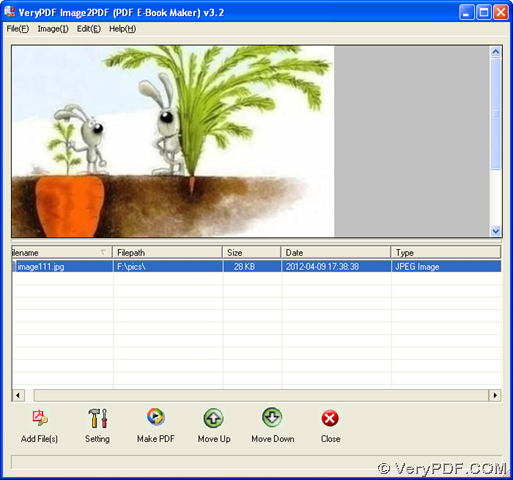 Image to PDF Converter can offer you 2 ways to convert JPG to PDF on computers of Windows platforms, for this software includes two applications: GUI version and command line version. Click this link below, then installer of Image to PDF Converter can be downloaded, then please double click this installer, and install Image to PDF Converter with setup wizard. Please click button of “Add Files” on GUI interface> select one JPG image in pop dialog box of “Image2PDF” > click “Open” there, then your JPG can be added like first picture shows. Then, if you want to preview it on GUI interface, please click its path in processing form, then it can display in preview panel. Then, you need to click button of “Make PDF” on GUI interface > select one destination folder in dialog box of “Save As” > click “Save”, so Image to PDF Converter can help you get PDF file from JPG file soon. 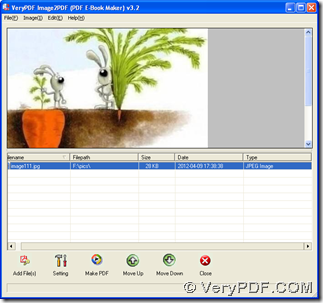 Please download zip file of Image to PDF Converter from this link: http://www.verypdf.com/tif2pdf/image2pdf_cmd.zip, and extract its content to your computer directly, then command line version of Image to PDF Converter can be used later. E:\image2pdf_cmd3.2\img2pdf.exe is the path of “img2pdf” which is typed for running Image to PDF Converter, and it is essential; -o is the parameter to give a command to Image to PDF Converter to produce PDF file on your computer, which is essential, too; E:\target\example1.pdf is the objective path, which needs to be typed for saving targeting PDF file on your computer with customized file name; "F:\JPG\example1.jpg" is the source path of JPG file, which is used for adding this JPG file for this process directly. So when you finish typing the commands like above, it’s time to produce PDF file with one click on “enter” in command prompt window. Then, you can get your PDF file in destination folder automatically. By now, if you have any questions on GUI version of Image to PDF Converter and command line and this process from JPG to PDF, you can go to official website of Image to PDF Converter and leave your comments here, we will offer you a perfect support! Thank you for joining here. 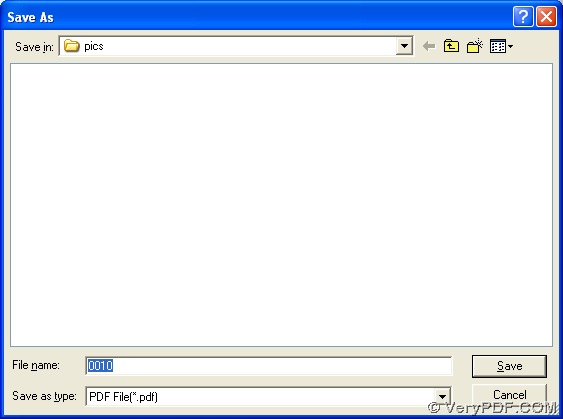 This entry was posted in Image to PDF Converter and tagged command line, jpg to pdf. Bookmark the permalink.